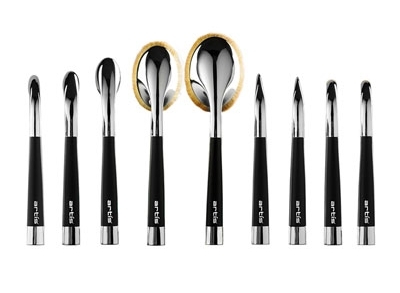 The Artis Fluenta 9-Brush Set, exclusively at Neiman Marcus. $400. The Artis Fluenta brushes, exclusively at Neiman Marcus, are just like their lovely sisters, the Artis Elite Mirror Collection brushes. I am a fan of this style of brush, and, as such, the Artis Oval 10 is in My Brush Betty’s Hall of Fame. 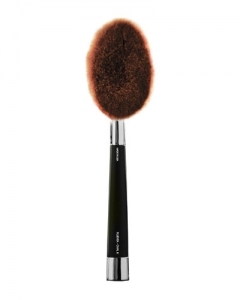 If you’re new to these Cosmefiber brushes — the brainchild of former MAC superstar makeup artist, Matthew Waitesmith — they are like big, luxurious face paddles that give a pretty natural finish. They blend beautifully and have a wonderful sensory appeal. See more of our coverage of the original Artis brushes here. For the most part, these are the same brushes as the originals, but with different handles and packaging. 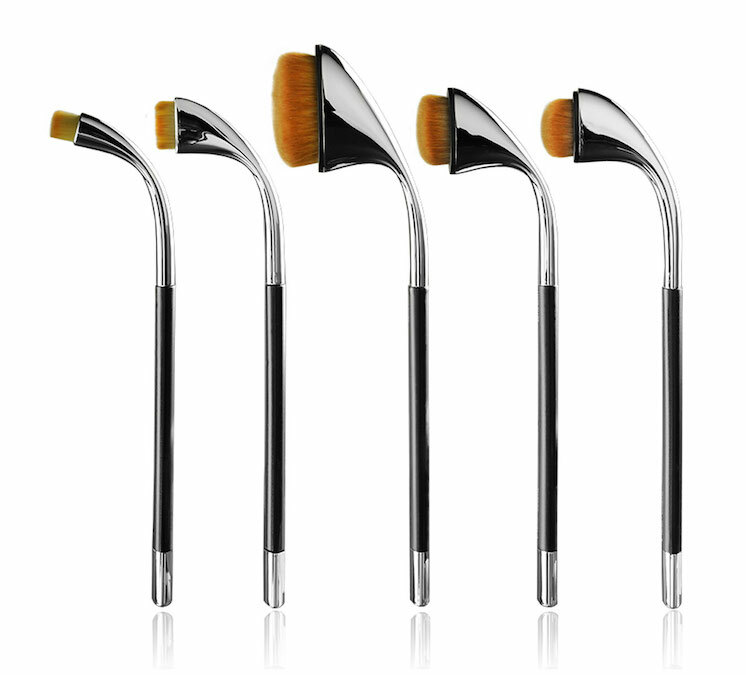 The Fluenta variation of these brushes for Nieman have a slightly more masculine or athletic feel to them, with sturdy shoulders and a wider stature at the foot. 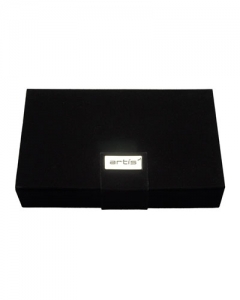 The 9-brush Artis Fluenta Set has a box to hold things in place. 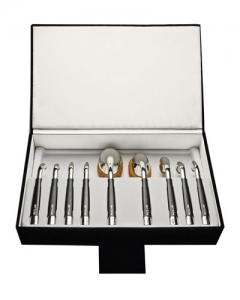 This velvet luxury box comes with the 9-brush set. They are dressed in black and chrome and feel decidedly tuxedo-like. The original Elite Mirror collection features white handles and are decidedly more femme with thin necks and pointy handles. 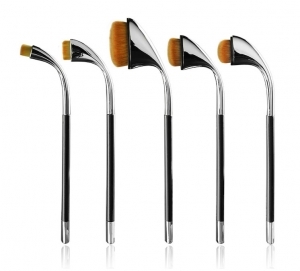 Nieman is selling the Artis Fluenta brushes in a variety of configurations. 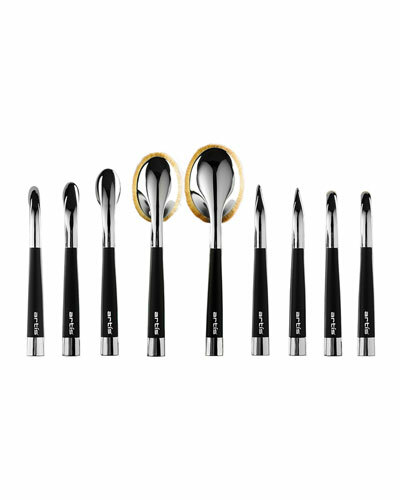 You can choose from a 3-brush, 5-brush or 9-brush set, or buy them individually. But here’s what I like best about this new set: the box that comes with the brush sets. The thing I have disliked about my own Artis brush set — and I have the full Elite Mirror Collection — is traveling with them. I have the little white quilted pouch that is sold as an accessory to the original set, but they just don’t travel or store well. They bounce up against each other and get mushed up. They need a system that holds them in position, like any brush roll would do for a standard brush. This velvet box, with the form-fitting innard, seems like a good solution. If you can just try one, go for the Oval 6 or 8 for foundation application. Or maybe the Circle 1R, which is a great eye brush. It’s honestly hard to choose. And I do feel obliged to point out what these brushes don’t do as well as standard brushes here: For ladies who like a highly painted face look, these aren’t ideal for that. 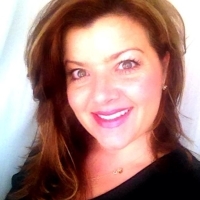 Because of their high blending ability, the finish is more diffused and blended. The result is much more soft and natural. 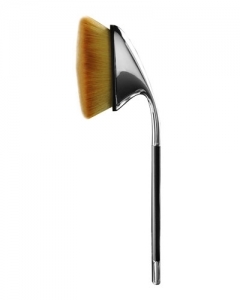 The Artis Fluenta Oval 8, brush view. The Artis Fluenta Oval 8, side view. despre Exclusively at Neiman Marcus – Artis Fluenta pe Google.